The original Joe Cool thumb splint is designed to maintain thumb abduction with minimal interference to grasp and tactile input. It is adjustable and machine washable (line dry). 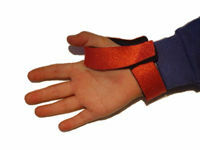 Joe Cool thumb splints are made of soft, flexible neoprene and have a hook and loop closure system. They do not have a latex component. Splints are pre-made, freeing up valuable time. 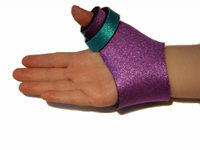 Splints come in a variety of sizes and colors. Inexpensive- prices range from only $15.95 to $18.95. Because they are made in popular colors, children are happy to wear them. Our new glove design will be easier to use while providing the thumb abduction & positioning needed for more functional use of the hand. The thumb strap may be adjusted for tone fluctuations during the day, or for various activities. Fingers are free for grasping and tactile information. Wrist flexion and extension should be uninhibited if the glove is fit properly. Important size information: Size is determined by measuring the width of the hand across the knuckles. See the size conversion chart on the order page.